Sharpie Tie Dye T-Shirts - C.R.A.F.T. 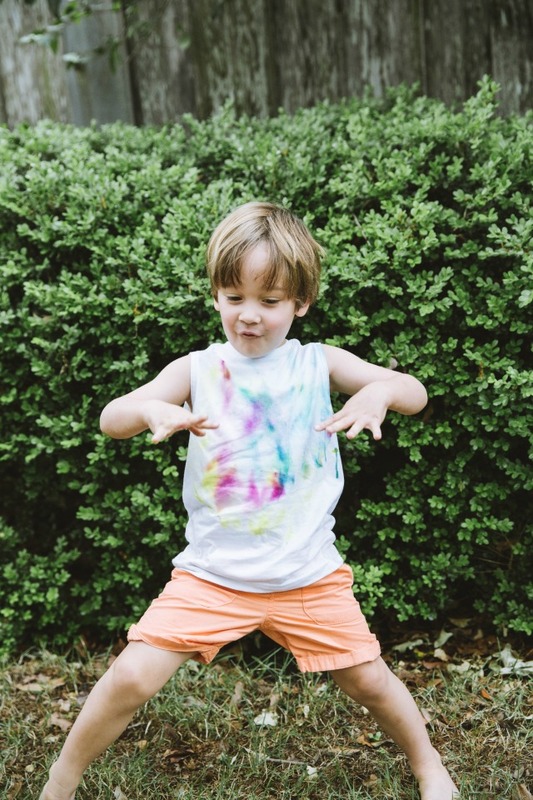 Sharpie tie dye t-shirts are one of those crafts that never gets old for me or the kids! We can do it for days in a row, and the process is just as exciting. I also love that you can use the same t-shirt multiple times and the designs continue to blend together. 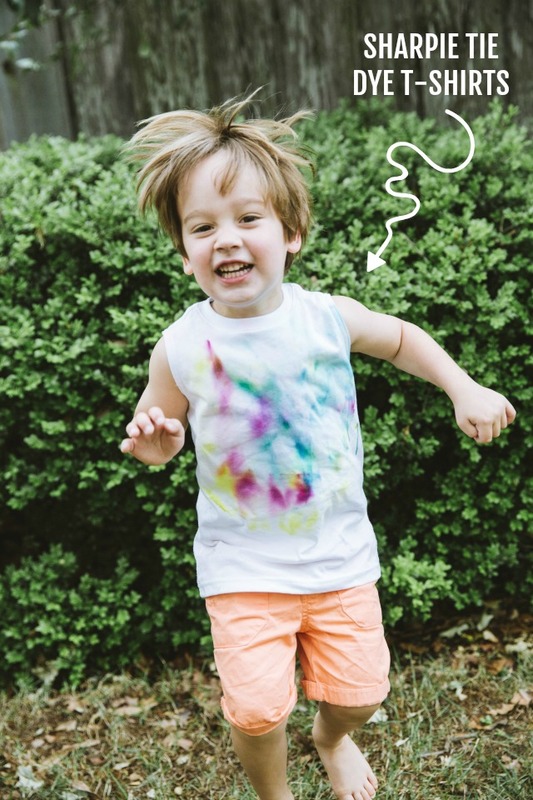 I highly recommend adding tie dye with Sharpies to your summer craft list! This post contains some affiliate links for your convenience. This means if you make a purchase after clicking a link I will earn a small commission but it won’t cost you a penny more! As for materials, I wanted to mention that 100% cotton t-shirts will hold the ink better than 50/50 blends. You can absolutely still use a t-shirt that are not 100% cotton, but the ink will likely fade faster in the washing machine than a 100% cotton t-shirt will. Also, my kids use the same t-shirt for this craft again and again. My son loved experimenting and watching the old and new colors bleed together! We always do this craft at our outdoor creative station. Sharpie markers and toddlers make a wee bit nervous inside! 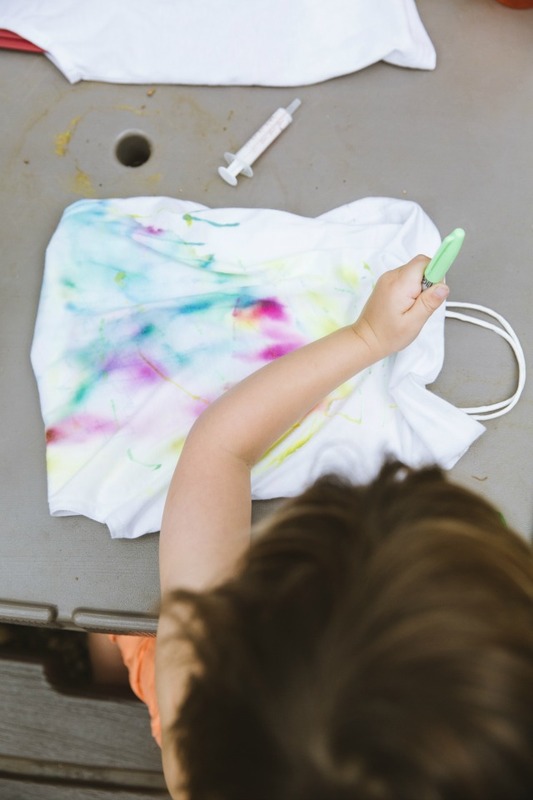 To set up for this craft, all you need to do is put a peice of cardboard or cereal box inside of the t-shirt so that the colors don’t bleed through. I actually used a random left over gift bag and a plastic folder I had laying on my desk. Almost anything will work! Let the kiddos go wild with the Sharpie markers. The scribble look turns out surprisingly well, so let the kiddos whatever they want! Pour rubbing alcohol into a plastic cup to make filling the syringe easier. Once the syringe is full of rubbing alcohol squirt it on the Sharpie marker! My 4 year old did this step all by himself, while my 2 year old needed help filling the syringe. I have also used Q-tips or even simply dripped rubbing alcohol onto the t-shirts from the bottle. 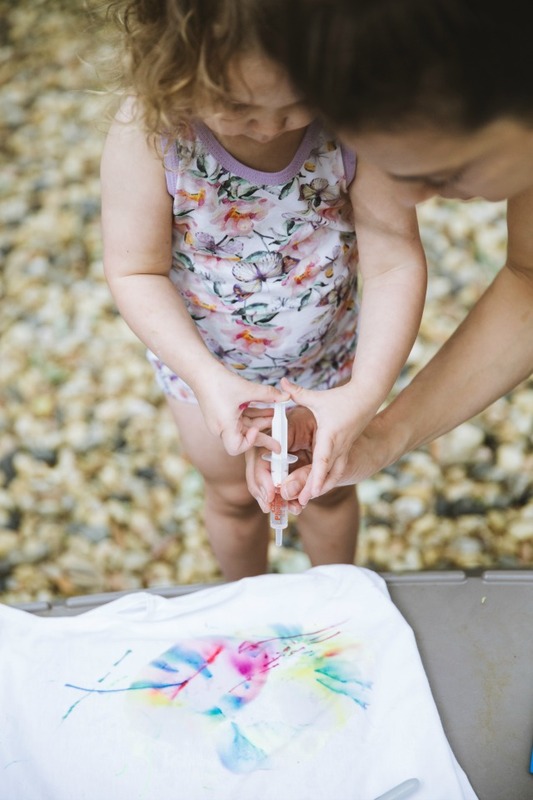 The syringe is by far the easiest and most fun method with kids. Also, Step 2 and 3 can be done interchangeably. Once the rubbing alcohol dries, throw the shirts in the dryer for 20 minutes to heat set the ink. You could also use an iron if that’s easier. That’s right, you can do this process time and time again with the same t-shirt! Oh and don’t forget about the back of your shirts! My kids love this craft so much they will do it multiple afternoons in a row. Sometimes, I wait a few days to heat set the shirts just to make sure they are 100% done, at least for a few days! It’s also fun to note, that I did a version of this craft many moons ago, back in 2010. I attempted to make it a more traditional tie dye, but I personally like the look of the random kid doodles way better than my attempts. I did an update to the original post with pictures a mom sent me of the tie dye t-shirts her girls made! Yes! No matter what you do, the ink will fade over time. That just means it is time to make more Sharpie tie dye shirts! Like I said above, using 100% cotton t-shirts and heat setting the ink is your best bet to long lasting tie dye. Can I tie dye with Sharpies on other things? Yes! 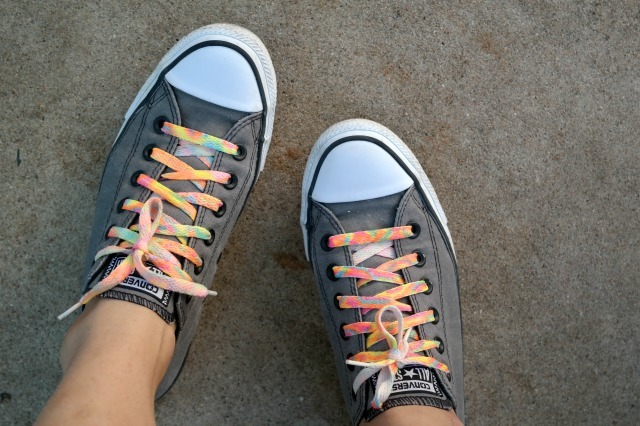 I have at tutorial for Sharpie tie dye shoelaces in my book, C.R.A.F.T. : 100 Seriously Fun, Super Easy Projects for Kids! It’s the exact same process, just a different material. I think it would also be fun to do with cloth bags. 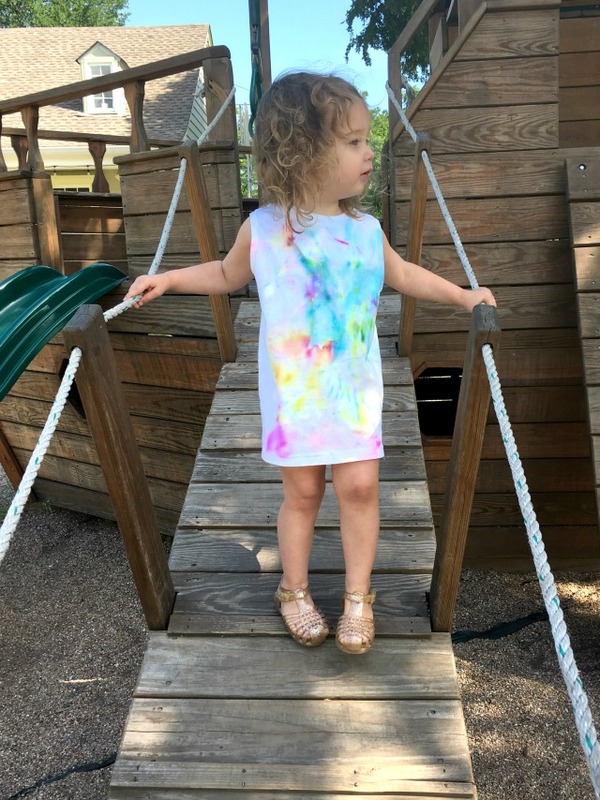 My daughter is wearing one of their creations as a dress on the playground. This is the same t-shirt my son is wearing in the picture above, but about 3 craft sessions later, ha! What a fun idea! I also like how kids can do this too ( of course with adult supervision hahah) This is wonderful, super fun for summer! Do you think I could put alcohol into a bowl and let the kids dip their shirts into the bowl instead of messing with the syringe?